AC vibrating bells produce a long continuous ringing sound. The striker continues to strike the gong in rapid-fire action as long as current is applied. 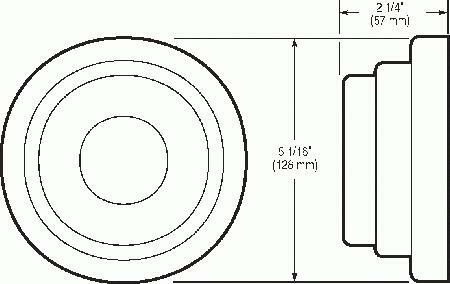 Universal Adaptaplate mounts directly on surface or fits any single-gang box, 3 1/4" (83 mm), 3 1/2" (89 mm), or 4 " (102 mm) octagon box, or any plaster cover with mounting holes on 2 3/4" (70 mm) centers. 6" and 10" bells also mount on 4" (102 mm) square boxes. Specified for timing, scheduling, paging and general alarm applications. 4" (102 mm) sizes recommended for quiet office areas. 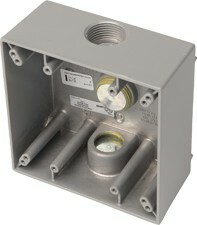 6" (152 mm) sizes for moderate noise level areas such as general factory areas. 10" (254 mm) sizes for loud areas such as heavy machine shops. Available with protective grilles. May be weatherproofed with the addition of a weatherproof box. 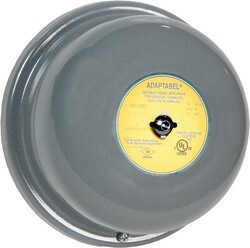 See Adaptabel Accessories for available options.